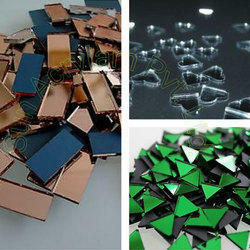 We provide Variable color in Acrylic Mirror Mosaic Pieces. We also provide Mosaic Mirrors in Variable Shapes. Craft Mirror Tiles offered can be made available by us in different smooth finish styles as well as in colourful presentation finish support which makes these highly demanded in the market. 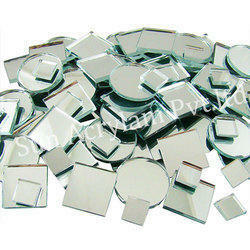 Further, these mirror tiles come in high quality and solid construction finish as well as are non toxic in usage. Some of its features include free of lead and nickel; solutions can be customized as demanded from us; well developed quality control system support for accurate finish of the job orders. 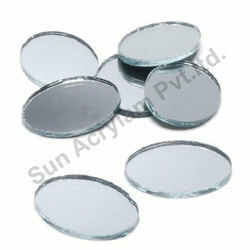 Mirror Acrylic Button offered comes in superior grade plastic-acrylic material finish and in size options of 8mm to 100mm. Further, these can be made available in options of different finish colors like white, anti-copper and others as well as come developed using advanced dyeing & cutting techniques so as to assure of reliable performance. Some of its features include lead free and nickel free usage; non toxic in use; classic and elegant designs; options of different color and design; made available at competitive price; can also offer custom solutions as demanded by the customers. Colour Mosaic Tiles offered can be made available by us i different finish configuration choices and provide for perfect usage support in homes as well as at commercial spaces. Further, these feature excellent quality finish and can be made available in different stock designs. Some of its features include available in choices like gold mosaic, crystal mosaic, glass mosaic, ceramic mosaic; suitable for interior and exterior walls; provide for practical and beautiful usage value; option of customized and unique patterns. We provide variable shapes of craft mirror. We also do sizing as per your requirement. We also provides Golden Mirror, Silver Mirror or whatever requires. 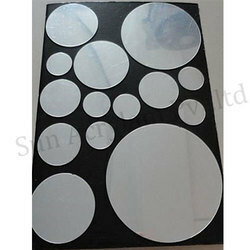 We provide variable Shapes in Craft Acrylic Mirror. We have variable colors in this also.Like Golden, Red, Silver, Blue, Flourocent, etc. We also Provide Customised Cutting in this. We are manufacturer of customised Mirror Mosaic pieces for wall cladding. Application of this Mirror will provide wonderful look to your interior. 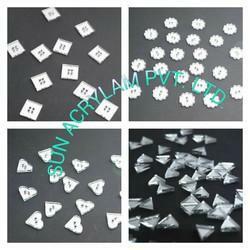 we provide Minimum 5000 pieces in this price. 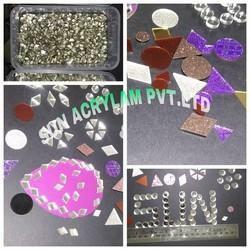 We can provide size and color as per your requirement in mirror mosaic.